AFRICANGLOBE – Africa’s richest man, Aliko Dangote of Nigeria, has said he is ready to invest billions of dollars in Zimbabwe’s economic enablers, among them power generation, cement production and coal mining. The investments will start early next year as long as the Government of Zimbabwe expedites logistical issues. 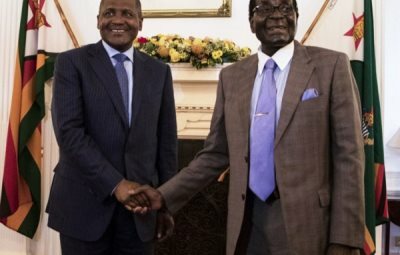 Mr. Dangote, who owns the Dangote Group, met President Mugabe at State House yesterday where he expressed his commitment to pour in billions of dollars in the investments. Earlier, Mr Dangote had met Vice President Emmerson Mnangagwa at his offices, who joined President Mugabe and Vice President Phelekezela Mphoko for the meeting at State House. Mr Dangote’s visit comes barely a month after a Chinese delegation came here to finalise the implementation of mega deals signed by President Mugabe on his State visit to the Asian economic giant last year. The deals are being implemented under the country’s economic blueprint, the Zimbabwe Agenda for Sustainable Socio-economic Transformation (Zim-Asset). Speaking to the media at State House, Mr Dangote described his meeting with President Mugabe as fruitful. “We had a very, very good meeting with the President and I briefed him that we have already decided to invest in three areas,” he said. “The first one is to do with power (generation), second one is cement (manufacturing) and the third one is coal (mining). “Our team will be back into the country next week to execute this plan and what we have already planned to do in terms of investment, to create jobs and also to help Zimbabwe to develop their own economy.” Asked about where the cement manufacturing plant would be set up and when actual work was expected to start, Mr Dangote said they would consider an area where there were massive deposits of limestone, gypsum and coal. Mr Dangote and his delegation that included Dangote Group executive director Mr Devakumur Edwin touched down at the Harare International Airport around 7am yesterday and had a packed itinerary until around 3pm. He first met VP Mnangagwa at the Ministry of Justice, Legal and Parliamentary Affairs offices around 8am, before meeting Foreign Affairs Minister Simbarashe Mumbengegwi at his Munhumutapa offices. The delegation then met Energy and Power Development Minister Samuel Undenge and Tourism and Hospitality Industry Minister Walter Mzembi at their respective offices. They also met Mines and Mining Development Minister Walter Chidhakwa and Transport and Infrastructural Development Minister Obert Mpofu, who is also the acting minister of Industry and Commerce. The Dangote Group, whose business spans across manufacturing, logistics and power generation, has interests in several countries, including in Zambia where it established a $400 million cement manufacturing plant. Speaking to the media after meeting VP Mnangagwa earlier in the day, Mr Dangote said all the coal that they used at their Zambian cement plant was from Zimbabwe. “What we need to do is that we will bring in cement here and take coal, but we want to set up an integrated cement plant here,” he said. “That actually may be bigger than all the plants that you have currently. “We will look at setting up something that will translate to about 1,5 million tonnes (of cement) per annum, so that when you continue to use cement there will not be a shortage of cement. We will make cement available here. “On the coal and cement, it’s Dangote Cement that will be investing. A week ago, Dangote Cement signed a contract with China’s Sinoma for $4.3 billion. Even with that, it will only take us over 70 million tonnes (for the international market). The projection is that by 2020, it should be at 100 million tonnes, then Zimbabwe will be an addition to try to get that target. “The timeframe for the investment is dependent on getting all the documentation, for instance the mining licences, but if we get everything this year, we will start construction by the first quarter next year. We will move very fast, but that all depends on the Government.” Mr Dangote said the fact that he came with his delegation was evident enough of their commitment to invest in Zimbabwe. He said they were ready to pour in huge sums of money into construction of a thermal power generation plant in the country. Geologists from the group, Mr Dangote said, would come to Zimbabwe in the near future to explore the area where they can set up the power plant. “You know, we have this fund, which is a joint venture between Dangote and Blackstone, which is Black Rhino here in Africa. We have $5 billion with them. It’s one of the vehicles that we want to bring to do the power generation,” he said. Blackstone and Dangote Group last year agreed to jointly invest up to $5 billion until 2020 in energy infrastructure projects across Africa with a particular emphasis on power, transmission and pipeline projects. Ms Josey Mahachi, a Zimbabwean based in Nigeria who hosts a lifestyle programme on M-Net, “Click Africa”, facilitated Mr Dangote’s visit. She said she was elated that her efforts were about to bear fruits. President Mugabe thanked her for being “a good ambassador for Zimbabwe” after she was introduced to him by VP Mnangagwa. Next articleAfrica’s Military: Who Has The Most Powerful Force?